It's no secret that I am absolutely obsessed with forensic studies, so it seems only natural that "CSI: Crime Scene Investigation" would be part of my regular television routine. It's one of my favorite shows, in fact! 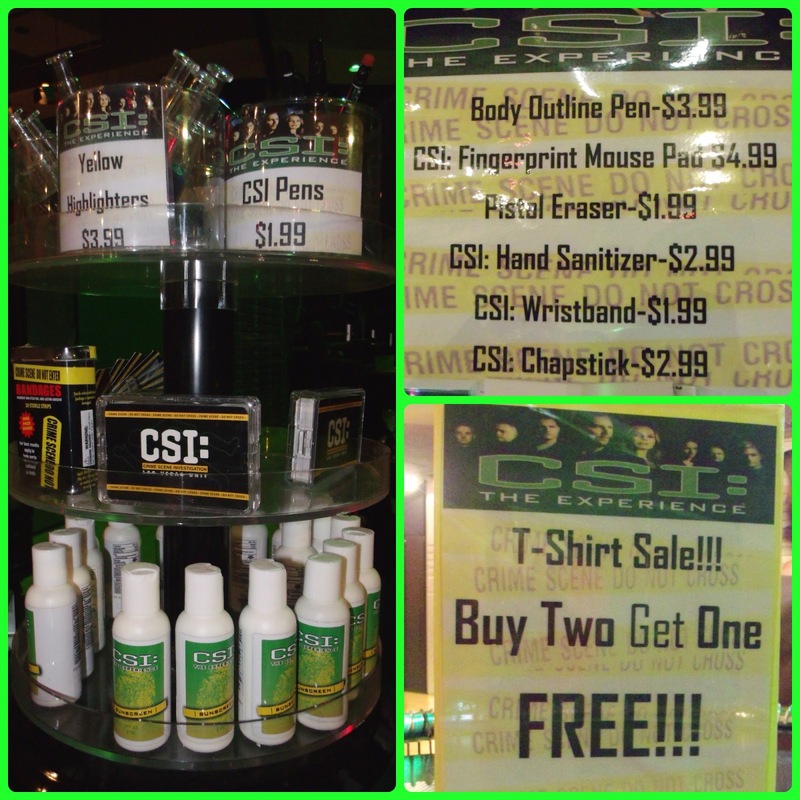 Of course, this led to me being extremely intrigued by CSI: The Experience on International Drive. This unique example of edutainment opened in 2012, three years after the successful debut of its first location in Las Vegas - an appropriate launching pad considering the show's setting. 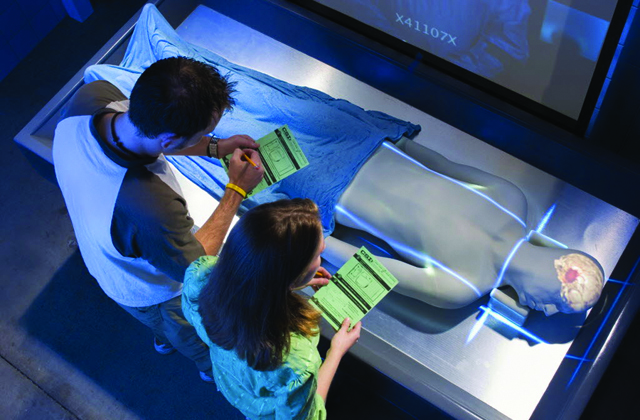 The building that houses CSI: The Experience also hosts two other attractions - one of which is considered temporary. While CSI is a permanent fixture, it shares the ground floor with an exhibit that is "traveling" in nature. Most recently, the feature was Our Body: The Universe Within. Before that, Star Trek: The Experience called this area home. January 25 was the last day to catch Our Body, which is now being dismantled to make way for something new. At this time, the nature of the new attraction has not been confirmed, but Chris Snyder of EMS Exhibits has informed me that they are contemplating two possible options. The new exhibit will be revealed soon, and may be open to guests by late February or early March. The third exhibit, Consumed by Art, opened in December. 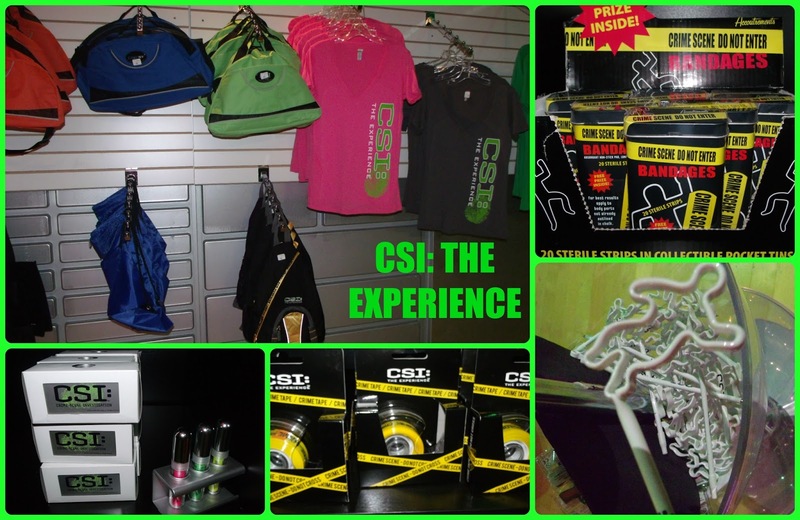 Let's explore this novel trifecta of creative amusement - starting with CSI: The Experience. Half of the downstairs exhibit area is devoted to CSI, with a virtual maze of crime scenes and labs. CSI teams gear up, and gather in the "Briefing Area" for an introduction to the experience, and instructions on how to proceed - directly from the cast and creators of the hit CBS series. Following briefing, teams split up to scour their pre-designated crime scenes. There are three scenes to choose from, and each team is given a form to keep notes on the clues they uncover during their investigation. This sheet is color-coded, as are the lab areas needed to assist each team along the way. Our clue sheet was green, for crime scene #1 - "A House Collided". CSI: The Experience is a no-photo zone. After all, new visitors shouldn't be given the advantage of advance inspection of the crime scene. For that same reason, I won't reveal too much about the scene we investigated. What I can say is this... leave no stone unturned. "A House Collided" finds you studying the events that led to a car winding up inside the living room of a home, with one "dead body" on the scene. CSI's are not allowed to compromise evidence by stomping through the crime scene, but the area is compact enough to still allow for a thorough investigation. I was grateful that my daughter had a small flashlight on-hand, however. Lighting is quite dim over the crime scenes. Observe every detail, noting blood trails, fingerprints - everything that looks out of place. As Gil Grissom says, "if it isn't written down, it didn't happen". Even the things that don't immediately stand out may be bigger clues than you realize. My children accurately made some amazing deductions and assumptions by looking at the most mundane items at the scene that were not the result of the "crime" that had taken place, but eventually became integral pieces of the ultimate puzzle. Once you've gathered your clues, it's time to head to the CSI Labs for analysis. Take note: you do not take pieces from the crime scene to the labs. Everything is already conveniently waiting for you in each lab for further study. This is especially handy if you happened to miss a clue at the scene. Our investigation required analysis of latent prints, impression evidence, trace evidence, blood pathology, toxicology, and DNA. Each of these studies involved working at different stations throughout the labs to learn about proper analysis techniques. The final investigative stop being the virtual autopsy, guided by Medical Examiner "Doc Robbins". This had to be my favorite spot in the labs, as the realism of the process was quite surprising and very informative. Other highlights included a hands-on microscope examination of fibers, and a detailed explanation and video demonstration of blood spatter types. Along the winding routes, be sure to pause and check out the various displays with memorabilia and video highlights from the television series! Once you have analyzed all of the evidence, be prepared to report to CSI's night shift supervisor, Gil Grissom with your findings. If you solve the crime, you're rewarded with the option to purchase your official CSI certificate. I'm not one to promote gift shops. In fact, I'm more commonly known to avoid them as they are usually overpriced tourist traps. This one is a very rare exception to that rule. As is the standard for most of our local attractions, CSI exits directly into a small shop in the reception area occupying the middle of the downstairs area. While not overstocked, this area will charm and delight any CSI fan. Aside from the usual offerings of t-shirts and tote bags, you'll find some very unusual keepsakes, cleverly themed around the idea of forensic investigation. Another surprising find: very reasonable prices! Here, you'll actually have options under $5, and dramatic sales on higher-end items such as clothing. After our investigation, I suppose I had a touch of confidence, and the belief that I had steeled myself to the tragedies of humankind. I was ready to face Our Body! This was another no-photo area, as well as a hands-off exhibit. Our Body did not center on violence or murder, but it did consist of human bodies on display. I can confirm that this type of exhibit is simply not for everyone. My daughter (18) was rather thankful that she forgot her eyeglasses, and she kept a nice, blurry distance from the displays. My son (15) had little reaction to the presentation, and I briefly spoke with another guest who couldn't have been more than ten, who was fascinated, and absorbing the exceptional education on biological anatomical processes. A section in the back of the Our Body exhibit was clearly marked with signs warning that prenatal and newborn bodies were behind the partition. A very smart consideration - as a mother, I can say that this is the one area I did find unsettling. 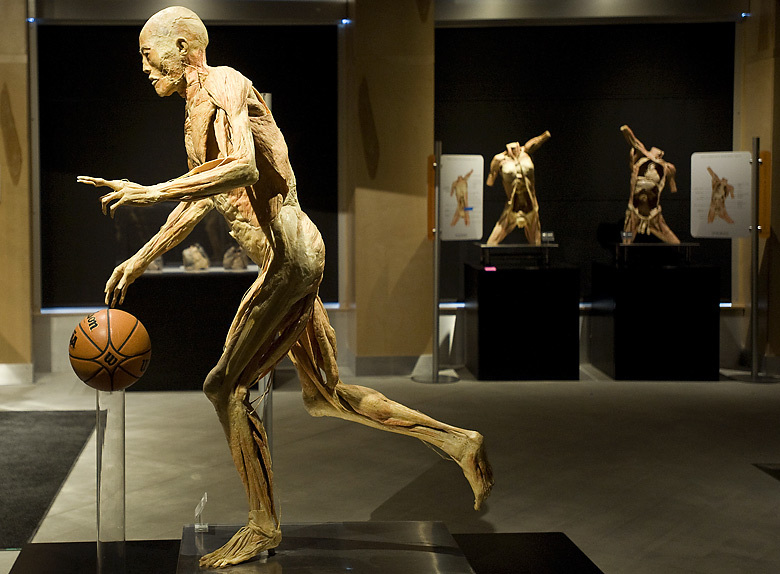 The bodies displayed in the Our Body exhibit were professionally preserved through a method known as "polymer impregnation" or "plastination", allowing for a detailed examination of the unique internal systems and outward physical abilities that guide the human body. 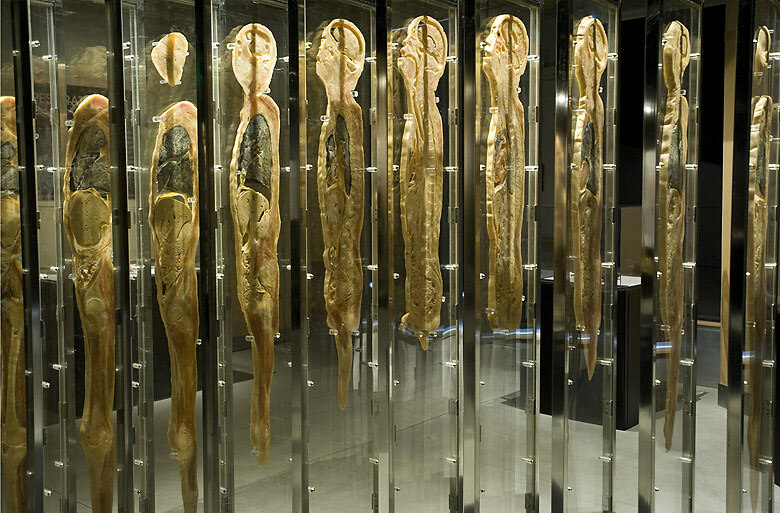 Bodies are displayed in various levels of dissection and in differing poses. Additionally, diseased organs are revealed alongside healthy ones for close observation of how illness and damage can wreak havoc on our functionality. Again, this exhibit has been removed from the CSI building. 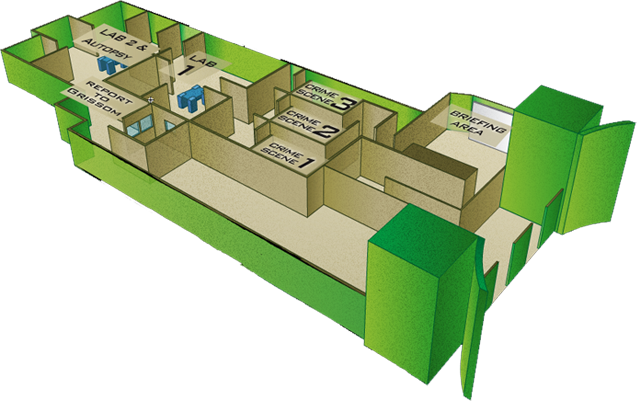 For more information on Our Body, and location information, visit them on the Web. Our third and final stop on our tour was Consumed by Art, which occupies an open area upstairs. This exhibit not only allows photography - it insists upon it! Consumed by Art features 15 grand-scale works of 3D art, specifically themed to invite guests into the displays for one-of-a-kind, fabulously fun photo opportunities. Bright spotlights and ambient music work cooperatively to establish themes in clustered sections. You might even see a familiar face. An employee is at the ready to help suggest logical poses with each vibrant display, but feel free to create your own ideas to capture the scene however you see fit. My kids tend to shy away from photos, but they genuinely enjoyed using mom as their own pose-able prop. I couldn't help but notice that every other group visiting the exhibit seemed as giggly as we were. Certainly, this is a sign of a truly enjoyable experience, and it's a great excuse to release your silly side - especially in the "jungle room".